The oldest recorded text on the diagnosis and treatment of nasal deformities can be found in the Edwin Smith surgical papyrus from ancient Egypt, which dates to some 30 centuries ago. In approximately 800 BC, Ayur Veda of Sushruta (India) described a nasal reconstruction approach based on the transfer of a pedicled forehead skin flap. In the 16th century, Tagliacozzi of Bologna, Italy, used brachial-based delayed flaps to reconstruct the nose. The science and art of rhinoplasty, as understood by most surgeons, remained essentially stagnant until the 19th century. In the 1840s, approaches to correcting nasal dorsal concavities were used by early pioneers, including Dieffenbach, who used a buried forehead flap to cover the nasal dorsum. The first paper on the treatment of the saddle nose can be attributed to John Orlando Roe's original article in 1887, "The deformity termed 'Pug-Nose' and its correction, by a simple operation." In 1892, Robert F. Weir published his techniques for correcting the saddle nose. In 1896, Israel applied a tibial bone graft to the nose. Treatment of the saddle-nose deformity tested the creativity of early nasal surgeons like Jacques Joseph. The treatment of saddle-nose deformities has continued to benefit from the contributions of countless pioneers of nasal surgery in the 19th century and masters of rhinoplasty in the 20th century. An image depicting saddle nose deformity can be seen below. Findings typical of a moderate-to-severe saddle nose include nasal dorsal concavity, shortened vertical nasal length, and loss of nasal tip support and projection. Patient (former boxer) with moderate-to-severe (type 3) saddle-nose deformity. Patient with a history of relapsing polychondritis and severe saddle-nose deformity (type 4). Close-up view of auricular cartilage damage secondary to relapsing polychondritis with a saddle nose in the background. The prevalence of saddle-nose deformities is difficult to assess. The prevalence is higher in population groups prone to facial trauma (ie, boxers, criminals, athletes), in persons with a history of intranasal cocaine use, and in individuals with a history of nasal surgery (eg, radical submucous septal resection, reductive rhinoplasty). A flat or concave nasal dorsal contour can resemble a saddle nose and is more prevalent in certain familial and racial groups. Some saddled noses may be more subtle, owing to thickened nasal skin soft-tissue envelope. A saddle-nose deformity can be congenital or acquired. Various degrees of nasal dorsal depression can be noticed as a part of individual, familial, syndromic, and racial characteristics. Most saddle-nose deformities are acquired. A common theme in all acquired saddle-nose deformities is a structural compromise of the nasoseptal cartilage leading to decreased dorsal nasal structural support. The most common causes of saddle-nose deformities are traumatic and iatrogenic. Direct trauma to the nose can fracture the cartilaginous and/or bony septum, hence compromising important support structures. Nasal bone depression due to trauma can also lead to a depressed dorsum. An unrecognized posttraumatic septal hematoma may become infected, causing irreversible cartilage damage and loss of support. In a study by Jalaludin, saddling was noted in 14% of patients with unrecognized or untreated septal abscesses. In that study, the leading cause of a nasal septal abscess was trauma. Birth-related nasoseptal trauma can also appear with various degrees of nasal deformity that may be erroneously labeled as being congenital. 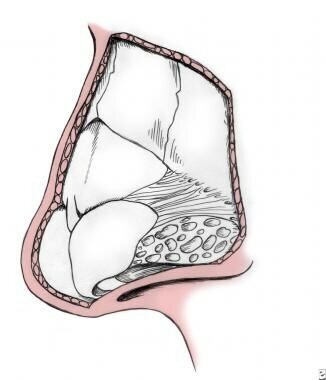 Overresection of septal cartilage can lead to collapse of the middle vault and saddling. Removing too much septal cartilage can compromise the structural integrity of the dorsal L-shaped strut and increase the probability of postoperative or traumatic saddling of the nasal dorsum. No cartilage should be resected anterior to an imaginary vertical line drawn from the rhinion (osseocartilaginous junction) to the nasal spine. During septal cartilage resection, leaving a minimum of a 10-mm dorsal-caudal L-shaped margin of cartilage is important. Arching the incisions, instead of creating right-angled corners, can also impart slightly greater structural integrity to the dorsal L-shaped strut. Surgical overreduction of a nasal dorsal hump can produce an overly concave nasal dorsum. Additionally, an unidentified open roof deformity can further contribute to middle vault depression. 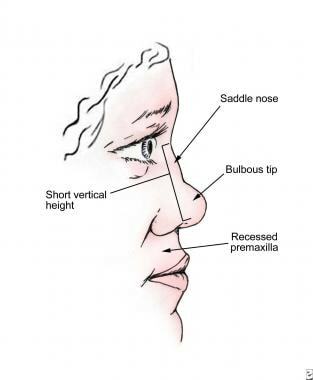 Disharmonious changes in the nasal contour (eg, an overly projected nasal tip, an exaggerated supratip break) can also impart the impression of saddling. Inadequate support of the upper lateral cartilages and the middle vault may lead to its settling and relative saddling of the middle vault with time. A number of medical conditions affecting the nose can result in damage to the septum and cartilaginous structures. The common pathway is damage to the cartilage; compromise in the structure; and various degrees of subsequent nasal dorsal saddling, as clinically observed. A number of conditions can affect the nasal septum and lead to a saddle-nose deformity. Intranasal cocaine use leading to large septal perforation and cartilage loss can also produce saddling of the nose. 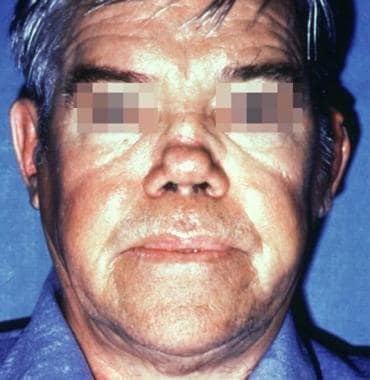 Wegener granulomatosis is characterized by necrotizing granulomas and vasculitis of the upper and lower respiratory tracts, including the nasal septum. The cycle of necrotizing granulomatous lesion and microabscess formation leads to cartilage destruction. Overall, Hansen disease, or leprosy, is rare in the United States. However, it may be more common in the Gulf states (Texas and Louisiana), and it is endemic in certain areas of the world. The nasal mucosa is frequently involved, and septal ulceration and perforations are common. Nasal deformities, including saddling, are common in advanced cases. 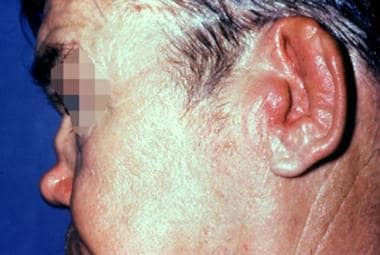 Syphilis can cause intranasal ulcerative lesions that can lead to osteochondritis; cartilage damage; and, eventually, saddle-nose deformity. Patients with saddle-nose deformities may have various degrees of nasal obstruction. Middle vault collapse is commonly observed in moderate-to-severe saddle noses. The inferomedial collapse of the upper lateral cartilages and corresponding narrowing of the internal nasal valve can produce significant obstruction that impairs nasal breathing. Large septal perforations often result in nasal saddling. Saddle-nose deformities with septal perforations can appear with nasal crusting, nasal obstruction, and whistling upon nasal airflow. In individuals in whom nasal airway compromise is noted, nasoseptal reconstruction should address important functional, as well as aesthetic, deficits of the patient's nose. An exact understanding of the deformity and dysfunction can allow for the proper selection of the best reconstructive option. Saddle-nose classification based on anatomic deficits. 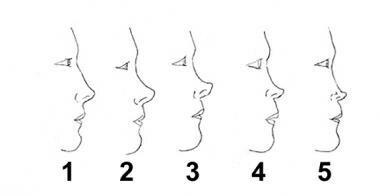 (1) Normal nose, appropriate nasal dorsal height, tip projection, and vertical nasal height. (2) Type 1 saddle-nose deformity, minor supratip or nasal dorsal depression, with normal projection of lower third of the nose. (3) Type 2 saddle-nose deformity, depressed nasal dorsum (moderate to severe) with relatively prominent lower third. (4) Type 3 saddle-nose deformity, depressed nasal dorsum (moderate to severe) with loss of tip support and structural deficits of the lower third of the nose. (5) Type 4 saddle-nose deformity, catastrophic (severe) nasal dorsal loss with significant loss of the nasal structures in the lower and upper thirds of the nose. Most patients with a type 2, 3, or 4 saddle-nose deformity have functional nasal airway obstruction. Complete history taking and physical examination is an important first step in evaluating the patient with a saddle-nose deformity. In particular, the history should include an investigation of the suspected etiology of the deformity, any history of nasal airway obstruction, any history of antecedent nasal trauma, the number of previous nasal surgeries, and any history of any autoimmune diseases. The use of intranasal cocaine or heroin should be investigated in patients with nasoseptal perforations. Upon physical examination, the degree and location of saddling, the state of the nasal septum, the status of the internal and external nasal valves, and the structural integrity of the nasal support structures must be evaluated. A higher rate of septal perforations is found in patients who have a saddle noses. Endoscopic nasal examination can facilitate an accurate survey of all endonasal structures. The standard series of photographs should be obtained prior to surgical planning for rhinoplasty. In-depth knowledge of the nasal anatomy is essential. The morphologic changes observed in a saddle nose are due to the loss of nasal skeletal support structures. These pathologic processes are discussed in the Pathophysiology section. 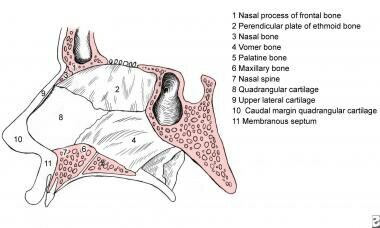 The osseocartilaginous support framework includes the nasal bones, the upper and lower lateral nasal cartilages, the septum, the premaxilla, and their attachments to each other (see the first image below). The nasal septum plays a robust role in supporting the middle and lower thirds of the nose (see the second image below). Nasal anatomy. The shape and function of the middle and lower thirds of the nose depend on the integrity of the nasal septum and on the quality and shape of the upper and lower lateral cartilages. Lateral view of the nasal septum. The primary support for nasal dorsal height and tip projection is determined by the size and integrity of the nasal septum. Roe JO. 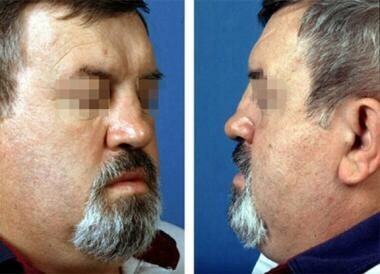 The deformity termed "Pug-Nose" and its correction, by a simple operation. New York Medical Record. 1887. 31:621. Weir RF. On restoring sunken noses without scarring the face. New York Medical Record: 1892. Durbec M, Disant F. Saddle nose: classification and therapeutic management. Eur Ann Otorhinolaryngol Head Neck Dis. 2014 Apr. 131 (2):99-106. [Medline]. [Full Text]. Won TB, Kang JG, Jin HR. Management of post-traumatic combined deviated and saddle nose deformity. Acta Otolaryngol. 2012 Jun. 132 Suppl 1:S44-51. [Medline]. Jalaludin MA. Nasal septal abscess--retrospective analysis of 14 cases from University Hospital, Kuala Lumpur. Singapore Med J. 1993 Oct. 34(5):435-7. [Medline]. Tzadik A, Gilbert SE, Sade J. Complications of submucous resections of the nasal septum. Arch Otorhinolaryngol. 1988. 245(2):74-6. [Medline]. Chauhan K, Bhimji SS. Relapsing Polychondritis. 2018 Jan. [Medline]. [Full Text]. Young K, Rowe-Jones J. Current approaches to septal saddle nose reconstruction using autografts. Curr Opin Otolaryngol Head Neck Surg. 2011 Aug. 19(4):276-82. [Medline]. Ezzat WH, Compton RA, Basa KC, Levi J. Reconstructive Techniques for the Saddle Nose Deformity in Granulomatosis With Polyangiitis: A Systematic Review. JAMA Otolaryngol Head Neck Surg. 2017 May 1. 143 (5):507-12. [Medline]. Coordes A, Loose SM, Hofmann VM, et al. Saddle nose deformity and septal perforation in granulomatosis with polyangiitis. Clin Otolaryngol. 2018 Feb. 43 (1):291-9. [Medline]. Razmpa E, Saedi B, Mahbobi F. Augmentation rhinoplasty with combined use of Medpor graft and irradiated homograft rib cartilage in saddle nose deformity. Arch Iran Med. 2012 Apr. 15(4):235-8. [Medline]. Sclafani AP, Thomas JR, Cox AJ, Cooper MH. Clinical and histologic response of subcutaneous expanded polytetrafluoroethylene (Gore-Tex) and porous high-density polyethylene (Medpor) implants to acute and early infection. Arch Otolaryngol Head Neck Surg. 1997 Mar. 123(3):328-36. [Medline]. Tas S. A New Technique to Correct Saddle Nose Deformity in Failure of Diced Cartilage Grafts: Diced Cartilage Flap. Aesthetic Plast Surg. 2015 Oct. 39 (5):764-70. [Medline]. Leach L, Shamil E, Malata CM. Indications and Long-term Outcomes of Open Augmentation Rhinoplasty with Autogenous L-shaped Costal Cartilage Strut Grafts - A Single Plastic Surgeon's Experience. Otolaryngol Pol. 2018 Jun 30. 72 (3):26-32. [Medline]. Gerow FJ, Stal S, Spira M. The totem pole rib graft reconstruction of the nose. Ann Plast Surg. 1983 Oct. 11(4):273-81. [Medline]. Welling DB, Maves MD, Schuller DE, et al. Irradiated homologous cartilage grafts. Long-term results. Arch Otolaryngol Head Neck Surg. 1988 Mar. 114(3):291-5. [Medline]. Naficy S, Baker SR. Lengthening the short nose. Arch Otolaryngol Head Neck Surg. 1998 Jul. 124(7):809-13. [Medline]. Ozakpinar HR, Gökrem S. A "modified-flying wing" procedure for the treatment of saddle nose and supratip pathologies. Kulak Burun Bogaz Ihtis Derg. 2011 Jan-Feb. 21(1):25-31. [Medline]. Conrad K, Gillman G. A 6-year experience with the use of expanded polytetrafluoroethylene in rhinoplasty. Plast Reconstr Surg. 1998 May. 101(6):1675-83; discussion 1684. [Medline]. Niechajev I. Porous polyethylene implants for nasal reconstruction: clinical and histologic studies. Aesthetic Plast Surg. 1999 Nov-Dec. 23(6):395-402. [Medline]. Turegun M, Sengezer M, Güler M. Reconstruction of saddle nose deformities using porous polyethylene implant. Aesthetic Plast Surg. 1998 Jan-Feb. 22(1):38-41. [Medline]. Beekhuis GJ. Surgical correction of saddle nose deformity. Trans Sect Otolaryngol Am Acad Ophthalmol Otolaryngol. 1975 Nov-Dec. 80(6):596-607. [Medline]. Tardy ME Jr, Schwartz M, Parras G. Saddle nose deformity: autogenous graft repair. Facial Plast Surg. 1989 Winter. 6(2):121-34. [Medline]. Murakami CS, Cook TA, Guida RA. Nasal reconstruction with articulated irradiated rib cartilage. Arch Otolaryngol Head Neck Surg. 1991 Mar. 117(3):327-30; discussion 331. [Medline]. Donald PJ. Cartilage grafting in facial reconstruction with special consideration of irradiated grafts. Laryngoscope. 1986 Jul. 96(7):786-807. [Medline]. Gunter JP, Clark CP, Friedman RM. Internal stabilization of autogenous rib cartilage grafts in rhinoplasty: a barrier to cartilage warping. Plast Reconstr Surg. 1997 Jul. 100(1):161-9. [Medline]. Ozturan O, Aksoy F, Veyseller B, et al. Severe saddle nose: choices for augmentation and application of accordion technique against warping. Aesthetic Plast Surg. 2013 Feb. 37(1):106-16. [Medline]. Hong SN, Mutsumay S, Jin HR. Long-term Results of Combined Rhinoplasty and Septal Perforation Repair. JAMA Facial Plast Surg. 2016 Dec 1. 18 (6):475-80. [Medline]. Conchal cartilage can be used as layered or sandwich grafts to fill defects on the nasal dorsum and to reconstruct columellar support. Rib cartilage can be sculpted to serve as an onlay graft to augment the nasal dorsal contour. A columellar strut can be assembled with a boat-shaped dorsal graft to reconstruct dorsal-columellar L-shaped strut. Rib cartilage can be used to carve both components of the graft. The author acknowledges his mentors (Dr. Dean Toriumi, Dr. Gene Tardy, Dr. Frank Kamer, Dr. Gary Burget, and Dr. J. Regan Thomas) for their gift of knowledge and practical surgical know-how.